It’s been really a lot this blog is now under silence due to my new home moving operations (more on this soon, promise) but I’ve recently been parte of a couple of things that are just too smart not to be written here. 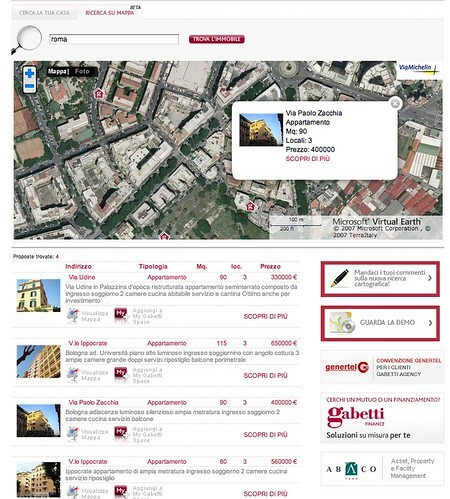 We just released the brand new map search for Real Estate listings on the Gabetti site; it’s a .NET application mounted on top of ViaMichelin API that you could use to look for an house in a specific area in Italy. The geodata are collected from the huge Gabetti listings database and placed straight on the cartography. We’re actually in semi-private (you should be a registered Gabetti site user; registration at the site is public and free) BETA and are collecting users feedback to improve the application. Uh, as a side note Gabetti is the first real estate company in Italy to have such an application. This year the conference will talk about the more and more computerLESS World we’re living in. You can join us on Tuesday, July 1st from 9am to 5pm for a FREE DAY (lunch & breaks included) in Turin (Italy) (complete info on venue here). My pal Leeander has really done a marvellous job for this year edition collecting a supa-dupa speakers frontline: Nicolas Nova, Bruno Giussani, Bruce Sterling, Elizabeth Churchill (Yahoo Inc.), and many more. As said the conference is completely free but reistration is required; use your Yahoo id to subscribe on the Upcoming page. My video introduction to Frontiers of Interaction 2008 from Matteo Penzo on Vimeo. UPDATE: the conference has been a huge success; you can see all the talks video and the photos; we’ve been featured on a major Italian innovation newspaper and on Wired too! I really feel bad not to have updated the blog in the latest weeks, but I had the chance to store a nice amount of things to say and still need to have the calm time to fix some aspects of my private life; that’s why don’t expect to find me here too soon. Call to action: take part at Frontiers of Interaction and give a try to the brand new Gabetti Map Search. This entry was posted in Beef and tagged 2.0, application, frontiers08, gabetti, real estate, user experience by admin. Bookmark the permalink.